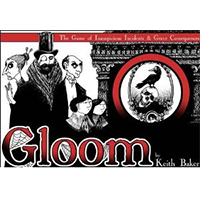 The world of Gloom is a sad and benighted place. The sky is gray, the tea is cold, and a new tragedy lies around every corner. Debt, disease, heartache, and packs of rabid flesh-eating mice—just when it seems like things can't get any worse, they do. But some say that one's reward in the afterlife is based on the misery endured in life. If so, there may yet be hope—if not in this world, then in the peace that lies beyond.